INDIANAPOLIS - Before Friday's game against Orlando, Indiana coach Frank Vogel said David West had been eager to return to the court. "He's not a guy that likes to miss games. From the day he sprained his ankle he's been eager to get out there," Vogel said. The power forward missed the first 15 games of the season because of an ankle injury — one of several injured players that contributed to a 1-6 start for the Eastern Conference finalists from last season. West wasted little time making an impact in his first start of the season, scoring Indiana's first four points — and picking up two quick fouls — in a 98-83 win over the Magic. "Probably a little too anxious, a little too over-hyped, but I was able to settle down, sort of got my bearings under me and we were able to make enough plays as a group to really control this game," West said. West finished with 18 points. C.J. Watson also made his season debut, scoring nine points off the bench as the Pacers (7-9) start to get healthier. Indiana is still without George Hill and Roy Hibbert, and star forward Paul George, who will miss the season with a broken leg. But the returns of West and Watson will help Indiana's depth. "These last couple of weeks I've just been trying to get myself back in shape going through practices limited," West said. "It's good to be able to win this game here and keep moving from here. We've just got to continue to grow. As we get more healthy and get more guys back in the rotation, we just keep improving and get better game-to-game." 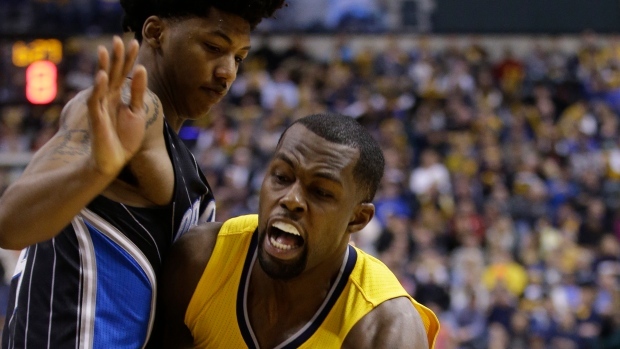 West's return to the lineup overshadowed a season-high 24 points for Rodney Stuckey. The seventh-year guard, in his first season in Indiana, improved on a 22-point effort in Indiana's previous game, a loss at San Antonio. "It feels great when you have your whole team out there and you're competing with each other, going to battle with your teammates," Stuckey said. "I'm still getting my legs underneath me. The more I play the better condition I'll be in. "When everyone went down there was a lot of uncertainty. We're happy where we're at right now. We just got to get better and take it one day at a time." Solomon Hill had 11 points and Lavoy Allen added 10 points and 14 rebounds for the Pacers. The Magic, meanwhile, continue to struggle in Indianapolis, where they've now lost four straight. Indiana improved to 30-17 all-time at home against Orlando (6-12). Nikola Vucevic led Orlando with 16 points. Tobias Harris and Victor Oladipo each scored 14 and Ben Gordon had 12 points for the Magic, who lost their fourth straight. Even with West's return to the lineup, Indiana led just 47-45 at halftime despite 10 Orlando turnovers. Helping the Magic's cause was a 15-0 scoring advantage from 3-point range in the first half. Orlando was 5 of 10 on 3-pointers in the first half while the Pacers were 0 for 7. West changed that with his first shot of the second half — a 3-pointer that gave Indiana a 52-45 lead. The Pacers finished just 4 of 16 from beyond the arc but didn't need the outside shot to fend off the Magic, who after cutting into a 15-point third-quarter Indiana lead could get no closer than eight points the rest of the way. Indiana outscored Orlando 48-28 in the paint and 18-2 on second-chance points. The Magic finished with just two offensive rebounds, the second-fewest in a game this season. Golden State had just one offensive rebound in a Nov. 11 loss to San Antonio. "Sometimes rebounding is just me against you," Orlando coach Jacque Vaughn said. "Our guys were warned before the game the effectiveness of not only the starters, but also the guys coming off the bench that would rebound the basketball too." NOT FULL STRENGTH YET - While Indiana welcomed back David West and C.J. Watson, PG George Hill (knee) and C Roy Hibbert remained sidelined by injury. Pacers coach Frank Vogel said Hibbert might be able to play Saturday at Cleveland, while Hill won't be back until mid-December at the earliest because of a tear in his quadriceps. Indiana opens a four-game road trip Saturday at Cleveland. Orlando travels to Phoenix on Sunday.